Dozens of broken-hearted international students with their friends and families dressed in heart costumes held hands in “One Giant Hug” around Concordia’s administration building on Valentine’s Day. They successfully caught the attention of the downtown public regarding the particular barriers facing international students. 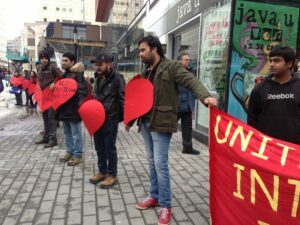 See Global Montreal’s coverage of the International Student Valentine’s Day Demonstration here.